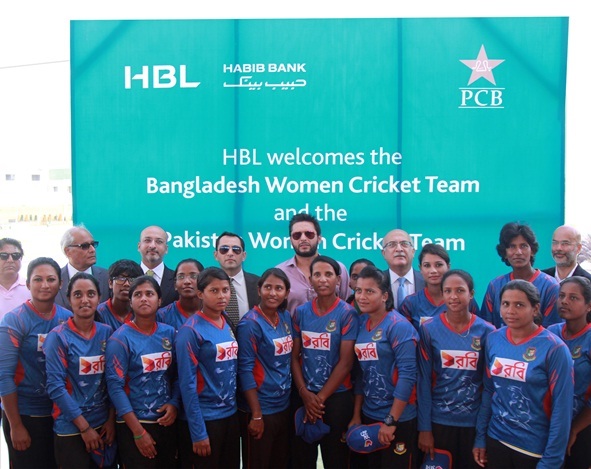 Karachi: October 14, 2015 – HBL hosted a ceremony in Karachi to celebrate the Bangladesh Women Cricket Team, which was touring Pakistan; the squad was the first women’s cricket team to play in Pakistan since 2006. Shahid Afridi, Pakistan T20 Captain and a member of the HBL Cricket Team, was the Chief Guest at the event, which was attended by Mr. A. Awal Chowdhury, Director of the Women’s Wing of the Bangladesh Cricket Board (BCB), senior officials from the PCB and the President and CEO of HBL, Mr. Nauman K. Dar along with other senior management from the Bank. Speaking on the occasion, Shahid Afridi mentioned how he had been a part of Team HBL for over 15 years, recognizing the Bank’s role for the enablement of cricket and other sports. He thanked the Bangladesh Government and BCB for sending the team to Pakistan, stressing the importance for sports as a tool for improving relations between countries. He also recognized the performance of the both sides, congratulating Team Pakistan on their series win. Speaking thereafter, the President and CEO of HBL, Mr. Nauman K Dar welcomed the Bangladesh team and gave special thanks to the Prime Minister of Bangladesh, Sheikh Hasina Wazed and BCB President Nazmul Hassan, recognizing their efforts in making this series a reality. He termed it an important step in promoting fraternity between the two countries and for the betterment of the sport. He mentioned that HBL’s first branch in Dhaka was opened in 1976; the Bank now has 7 branches there. He reminded the players that they were role models, saying that it was a mark of progress for women to be participating in sports like they are today. He told the players that they must believe in themselves, stating that there “was no reason that each one of you cannot achieve the place that Shahid has achieved”. He also expressed hope that this progress continues, stressing the importance of women participating in every field of life. The Defence Advisor to the Bangladesh High Commission in Islamabad, Brigadier General Mirza Ezazur Rahman was then invited to say a few words. He thanked the PCB and BCB for organizing the tournament, and recognized HBL for its important role in the enablement of sports. Shahid Afridi and Mr. Dar distributed gifts amongst both teams.